Janet Wickell began quilting during the quilt revival of the 1970's and it didn't take long for her to become hooked on the craft. 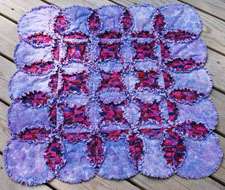 Janet was the freelance writer for numerous Rodale Press quilting books and she has contributed to many other books and patterns as both a writer and editor. Janet also teaches workshops about quilting and hand marbling on fabric. This quilt is brought to us by Janet Wickell who has dozens of excellent free quilt patterns on About.com's Quilting Page and also lists many wonderful patterns on her website, Scrap Quilts. Janet, on this Cathedral Windows quilt pattern: "Cathedral Windows rag quilts are beginner-friendly, so don't hesitate to try this popular quilt pattern even if it's your very first project. Quilts are made from individual circle sandwiches. Each sandwich contains a front, a batting and a backing. I've seen raggy Cathedral Windows Quilts made by using actual quilt batting as the middle layer, and they're lovely. However, the batting is not placed within the ragged seam allowances, since it wouldn't be stable in that exposed position. 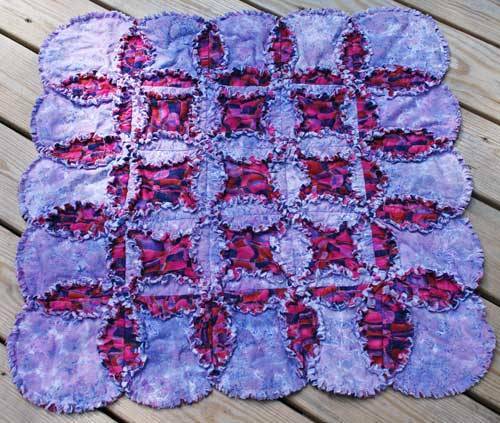 I prefer to use a flannel batting in rag quilts, because it is durable, doesn't need to be quilted and extends into the seam allowance to add depth and a narrow line of color."